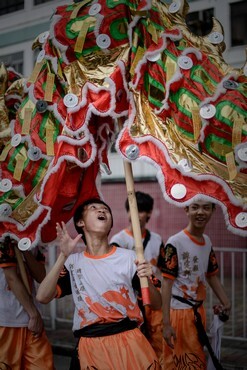 Hao Hao, a taiwanese artiste and crooner, in one of his costumes at Stomp's 6th Getai Awards held at Toa Payoh Central Amphitheatre on 25 July 2012. 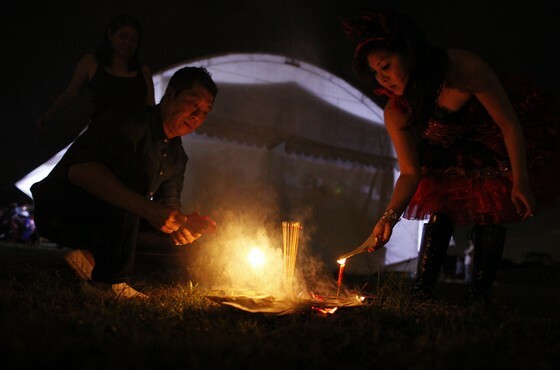 SINGAPORE - Let's loosen up and party. 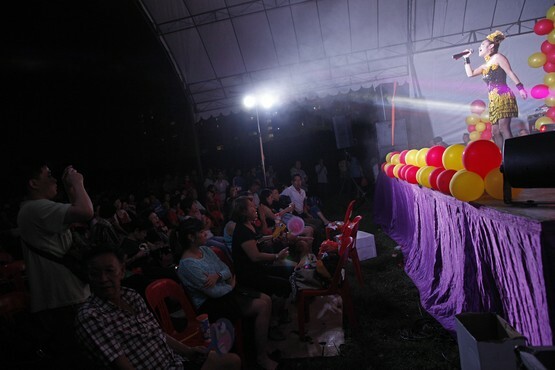 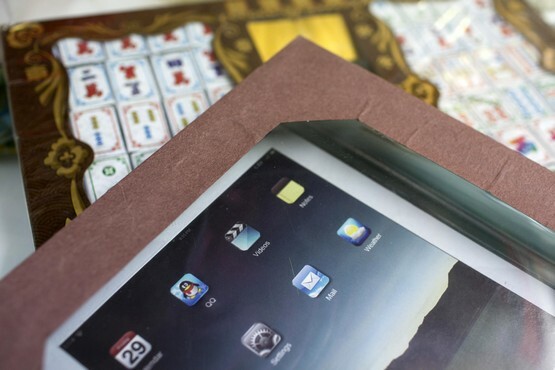 If the rules for getai get any stricter, it may well take away the fun. 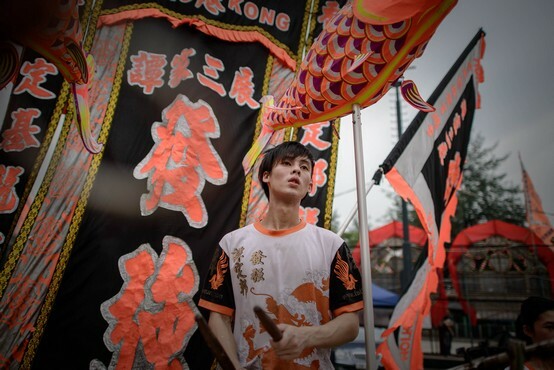 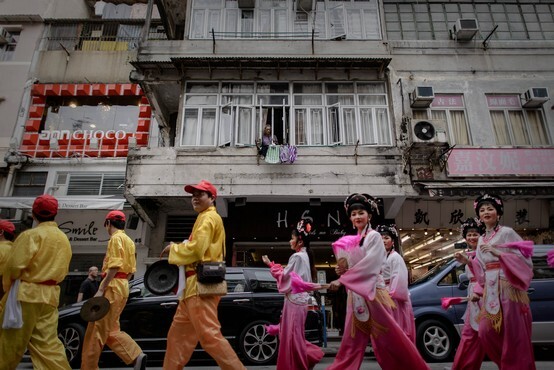 Flamboyant Taiwanese performer, Hao Hao, admits with a wary sigh that he is tired of always being asked if he'd get into trouble during the Hungry Ghost Month. 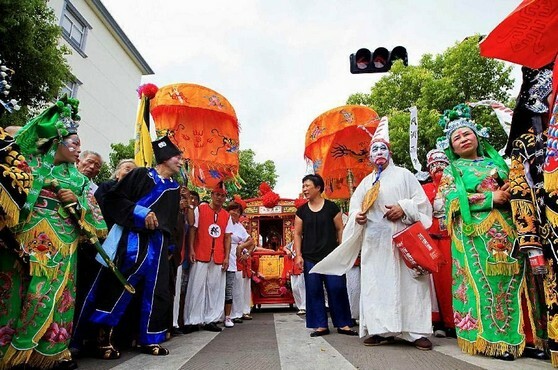 The heartland comes abuzz with these street shows on makeshift stages every year. 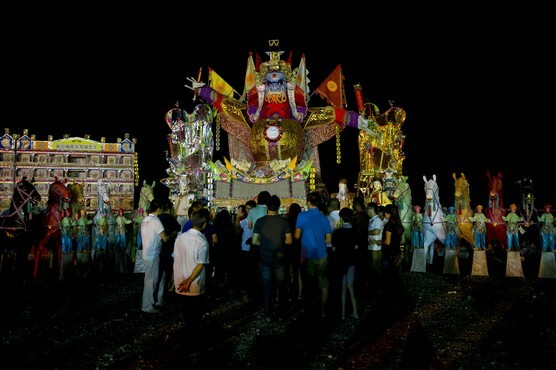 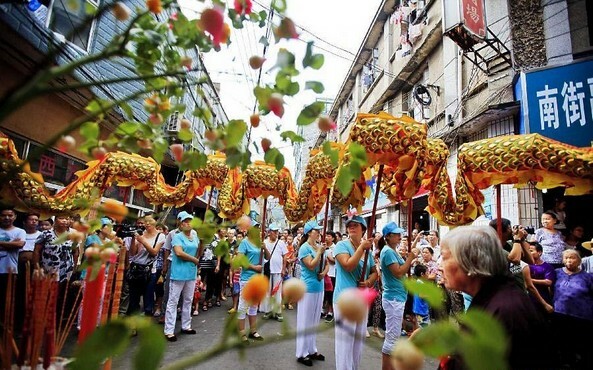 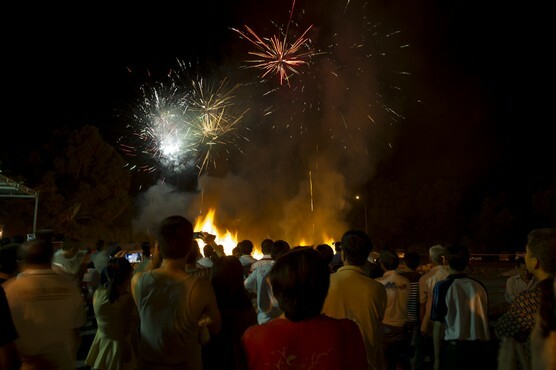 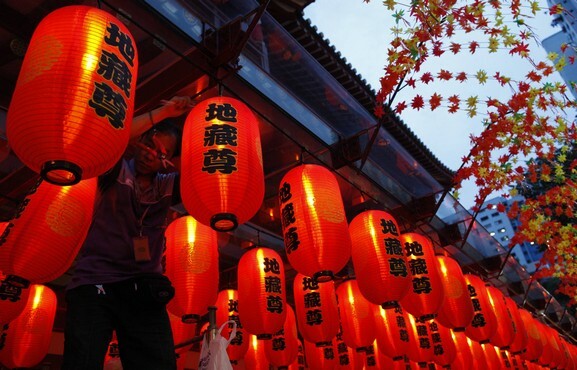 This year's festivities run from Aug 7 to Sept 4. 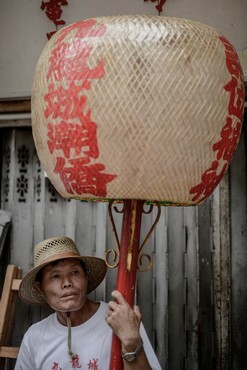 And Hao Hao is a firm favourite with heartlanders. 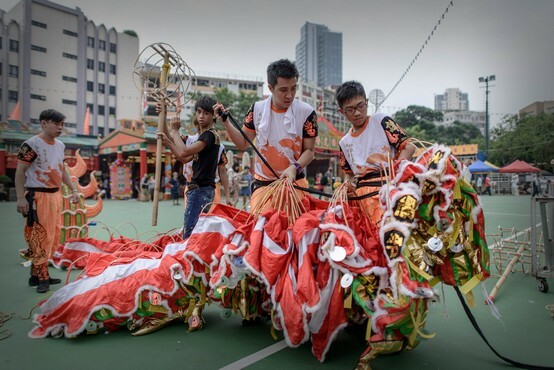 Earlier this month, reports emerged that organisers hoping to set up stage at popular getai locations such as Geylang and Jurong have not managed to get their licences approved this year. 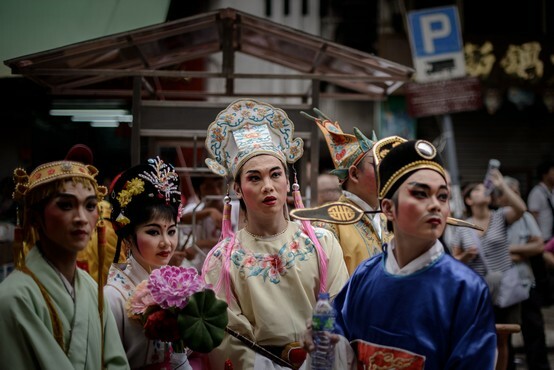 This was apparently due to concerns that getai had taken an increasingly risque turn with pole-dancing performers, skimpy outfits and male dancers baring their chests. 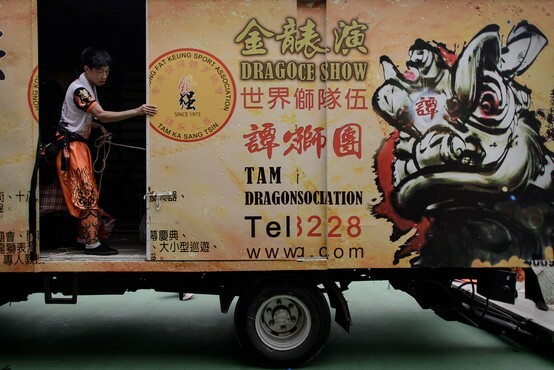 Some of these acts are not allowed under public licensing rules. 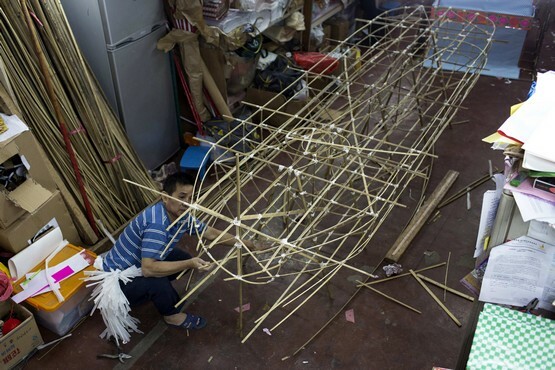 But Hao Hao flits with the regulations a little. 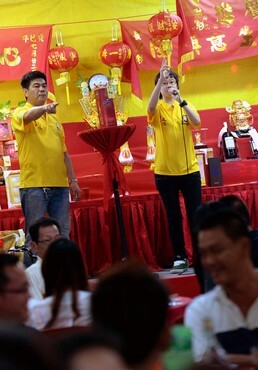 He prefers not to be reminded of past incidents, like one of his run-ins in 2009, when he hit the headlines for doing a Marilyn Monroe act at a getai show. 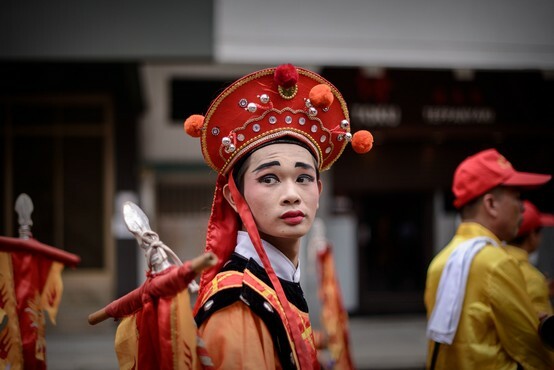 He did so without a permit to cross-dress, and allegedly flicked up his skirt to reveal a G-string underneath. 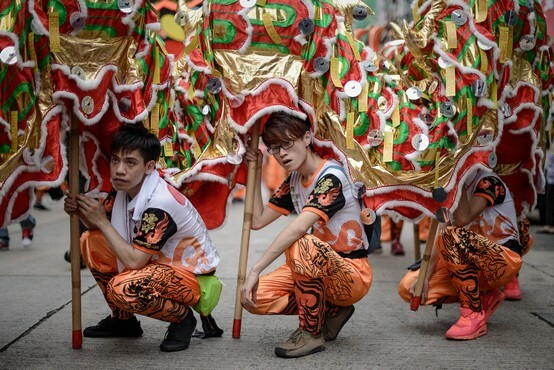 One of the conditions for getai performances is that performers must not be indecently attired. 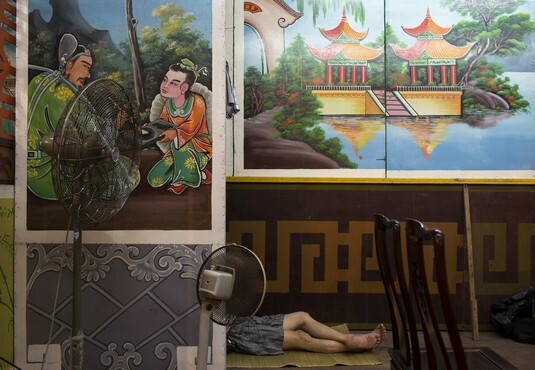 He was hauled up by the police but let off with a warning. 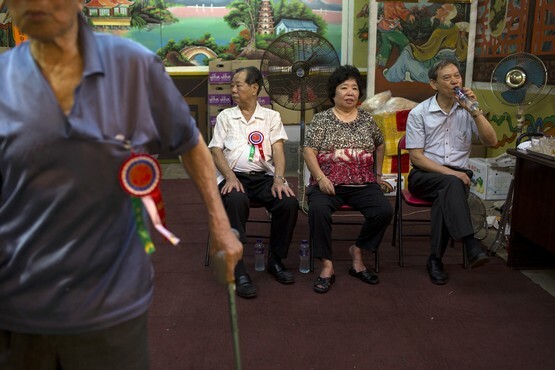 Hao Hao, 32, sighs again. 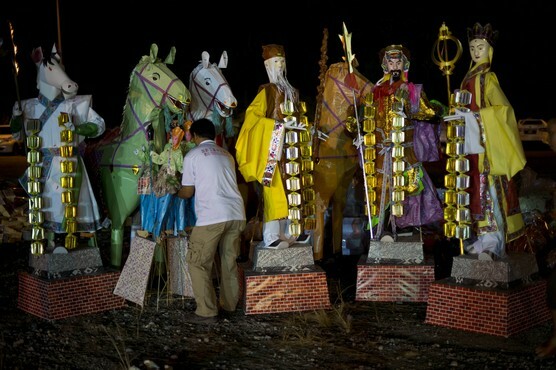 He says: "Let's not talk about the past." 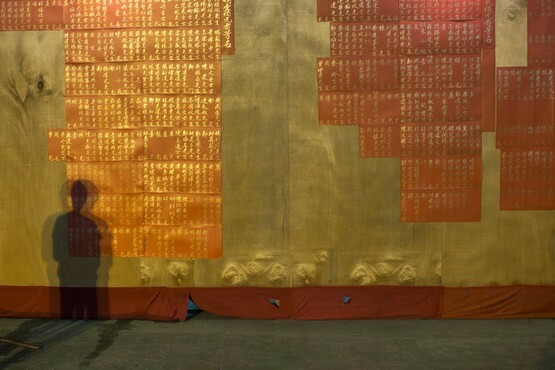 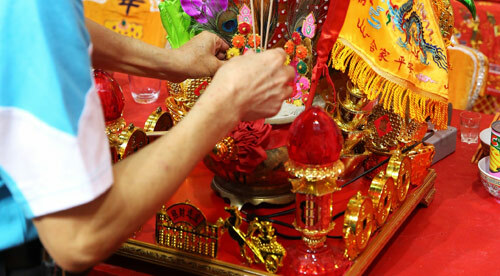 The Huat Chye Lor or auspicious urn that was auctioned for $488,888. 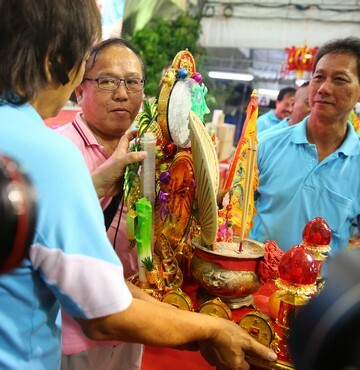 Lorong Koo Chye Sheng Hong Temple Association: The Taoist temple, located at Arumugam Road near Ubi Road, is popular with devotees. 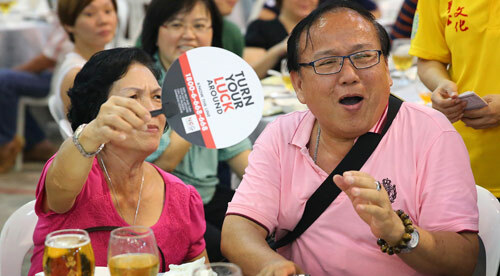 Mr Mok's father signing the receipt after his successful bid for the urn. 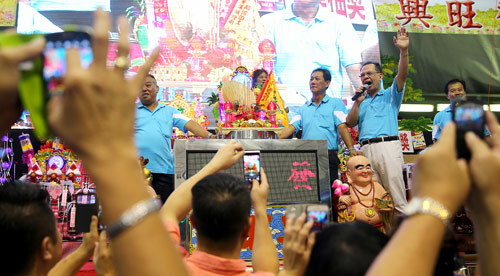 The Huat Chye Lor or auspicious urn attracted more than 20 bids. 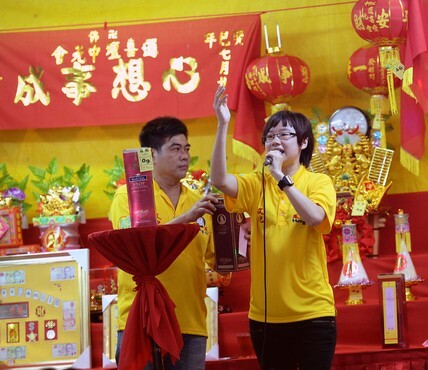 Miss Gwee Wan Ling (right), an auctioneer. 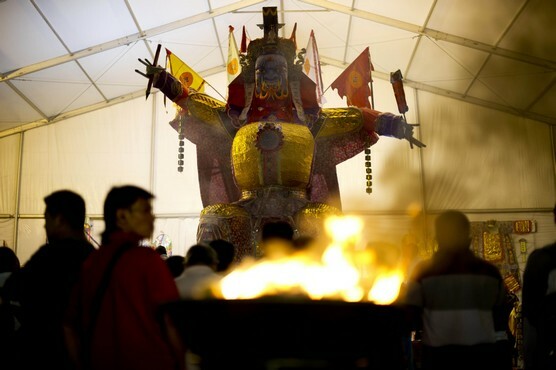 She works the crowds during the Hungry Ghost Festival auctions, where lucky items are sold to bidders in return for good fortune. 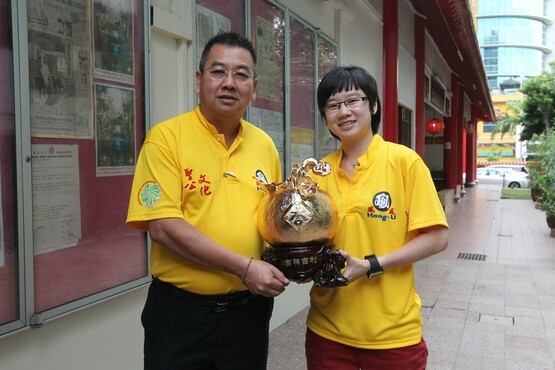 Miss Gwee also has a day job as a human resources executive. 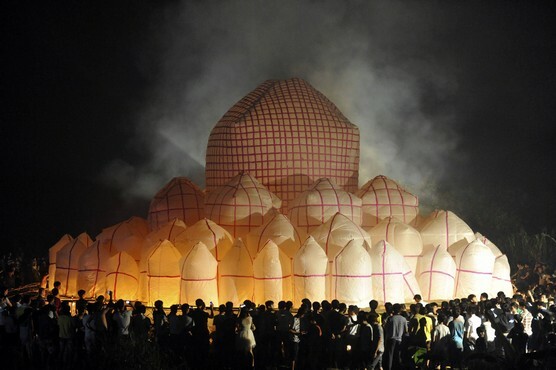 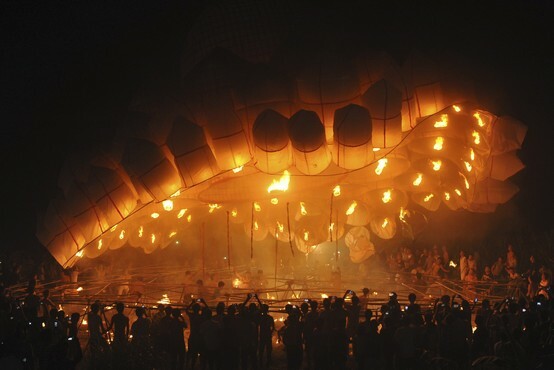 People launch a 30-metre-diameter paper lantern at Xiapo village, Qionghai, Hainan province, early August 27, 2013. 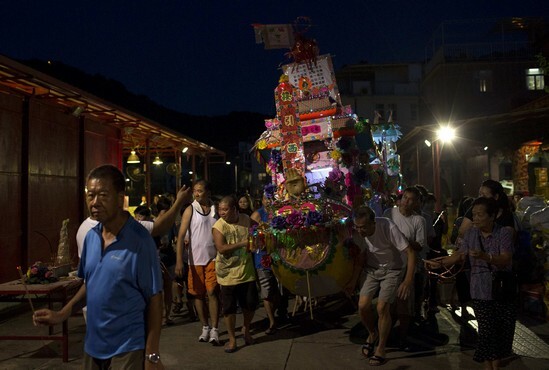 The lantern, made of 72 smaller lanterns, was designed for a local ritual ceremony to mark the Chinese Hungry Ghost Festival. 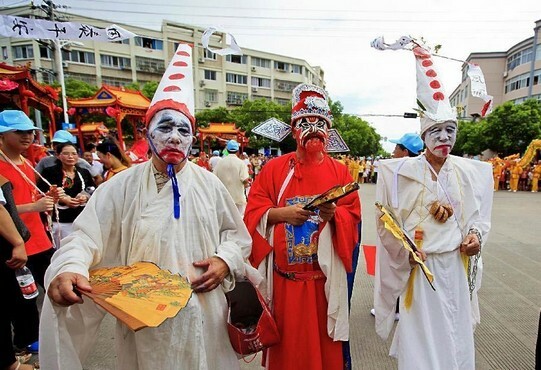 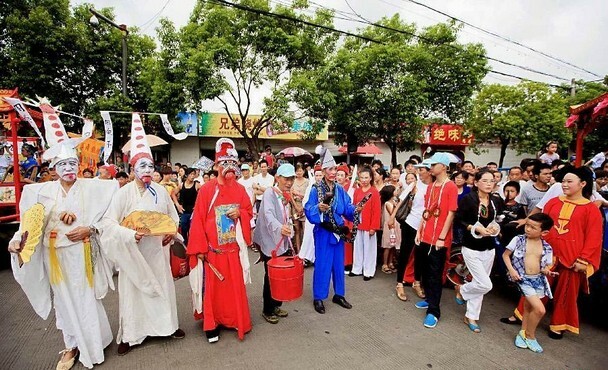 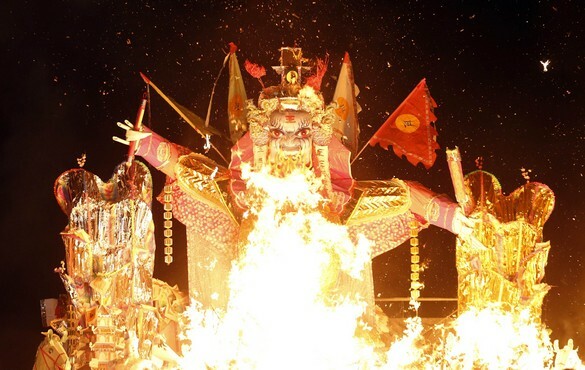 The Ghost Festival, also known as Yu Lan, is a traditional Chinese festival on the 15th night of the seventh month of the Chinese calendar. 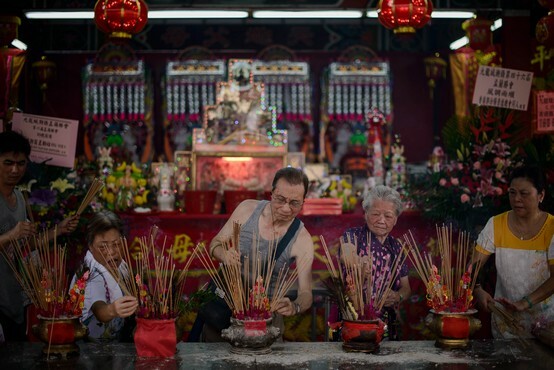 In Chinese tradition, the month is regarded as the Ghost Month, in which ghosts and spirits, including those of deceased ancestors, come out from the lower realm to visit the living. 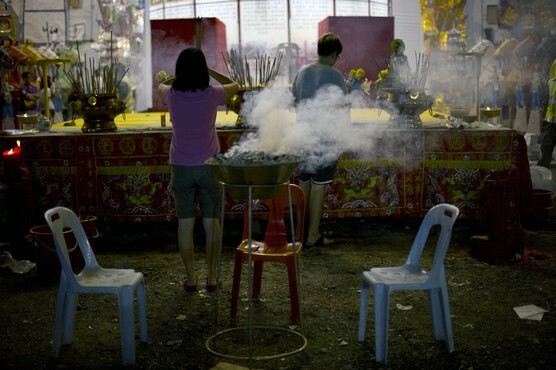 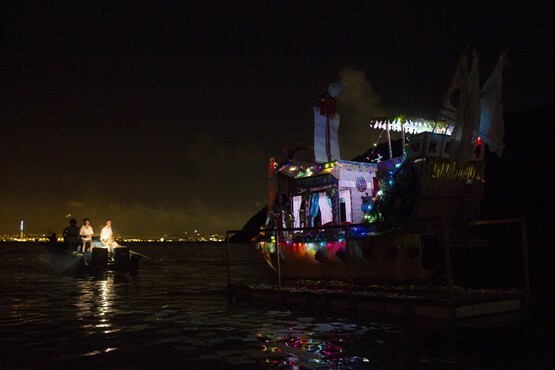 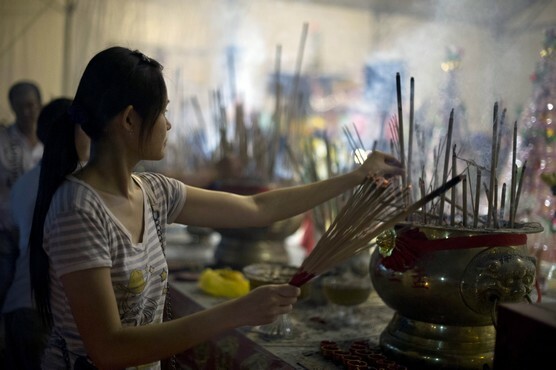 Worshippers prepare ritualistic food offerings and burn joss paper - a paper form of material items - for the ghost. 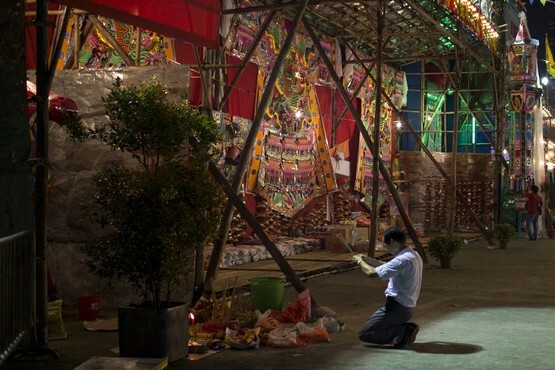 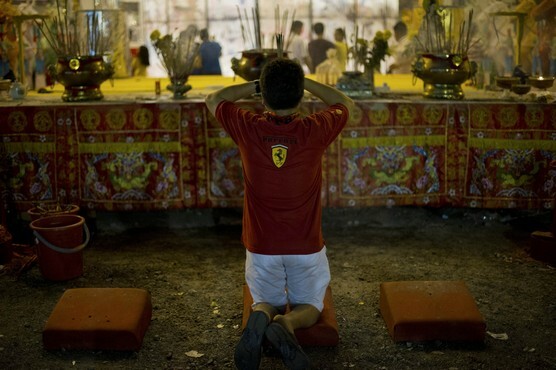 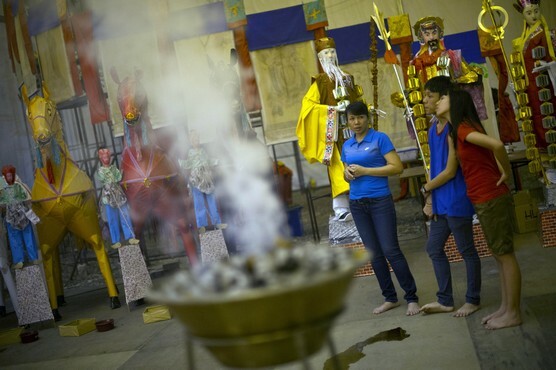 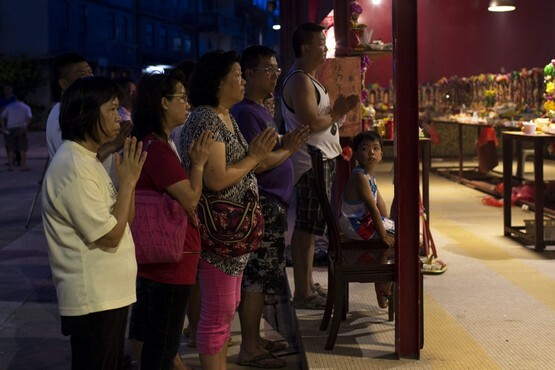 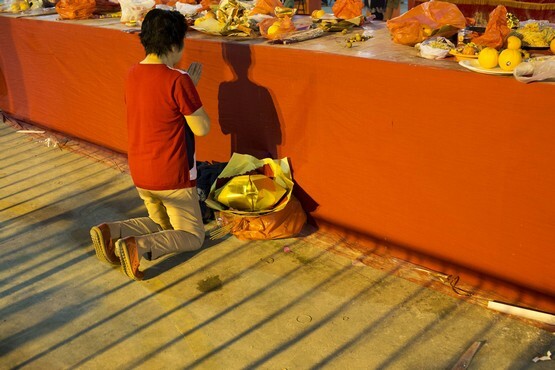 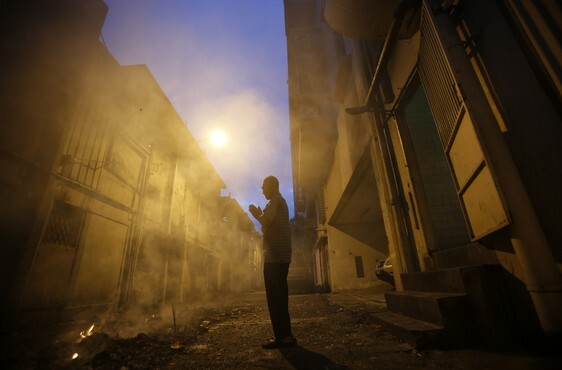 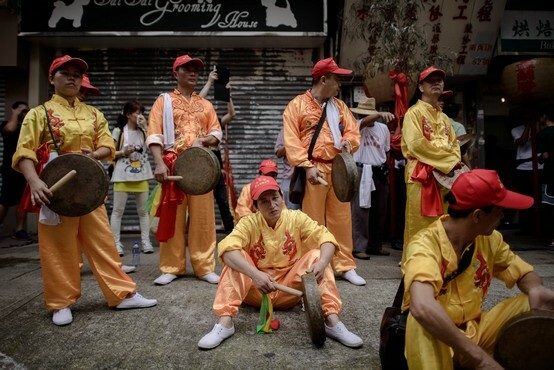 Worshippers pray during the Chinese Hungry Ghost Festival at a temple in Hong Kong. 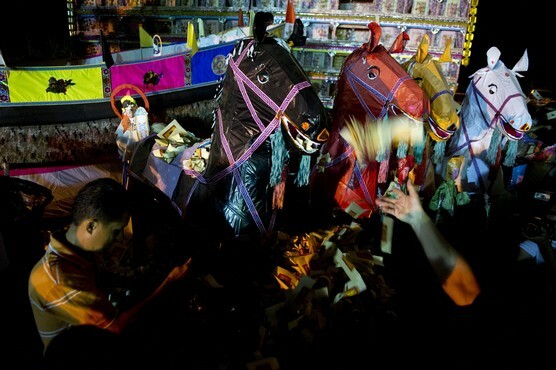 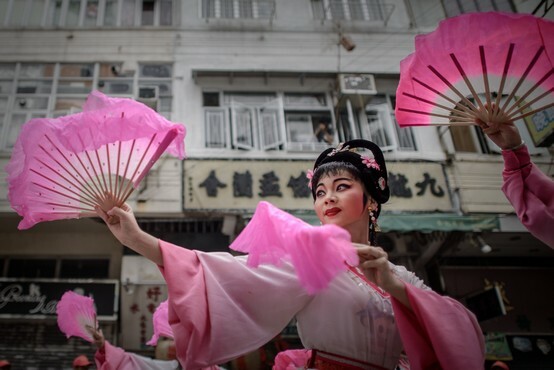 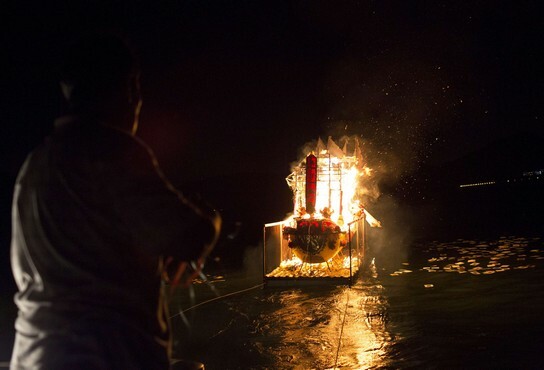 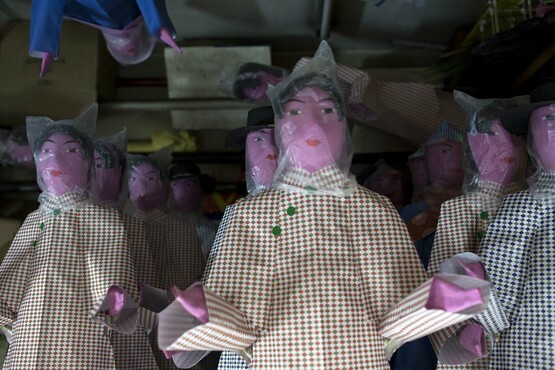 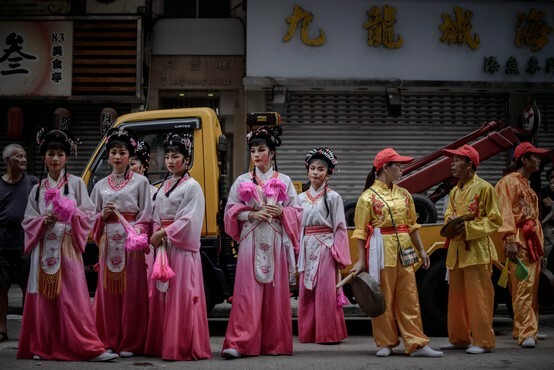 Paper replicas of servants which are believed to be used by ghosts after being burned are seen for sale for the Chinese Hungry Ghost Festival in Hong Kong. 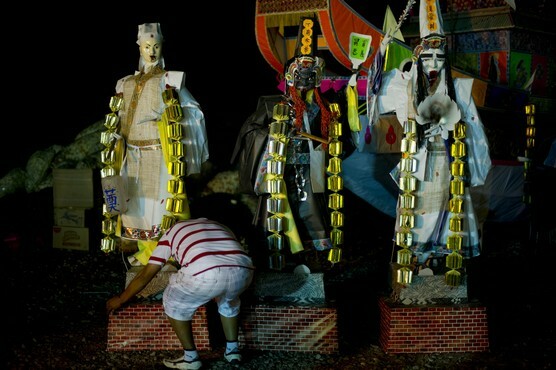 Other paper items in the form of clothes, gold and other fine goods are also burnt for the visiting spirits of the ancestors to show respect. 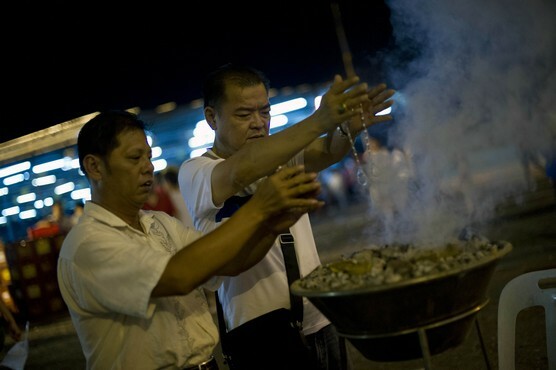 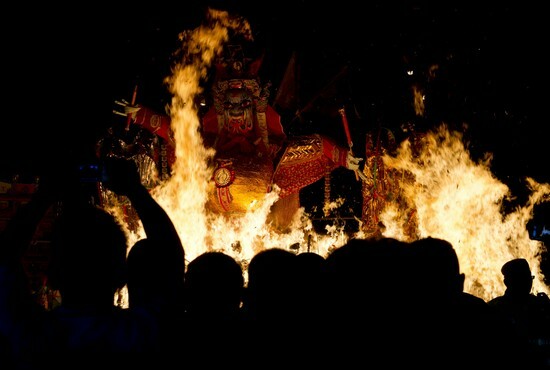 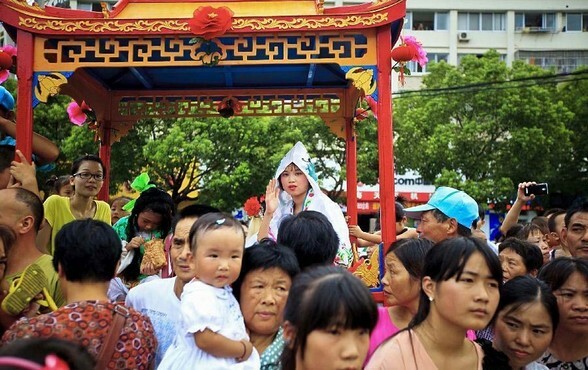 The festival, celebrated in the seventh lunar month of the lunar new year calendar among communities in southern China, Malaysia, Singapore, Hong Kong and Taiwan, marks the belief that the "Gates of Hell" are opened to let out the hungry ghosts who then wander in the land of the living while foraging for food. 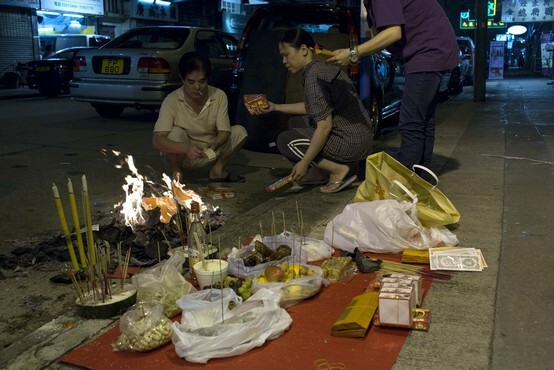 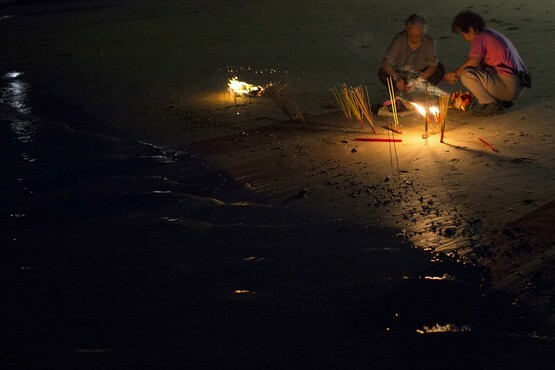 During the festival, food offerings are made while paper money and joss sticks are burnt outside homes to keep the spirits of dead ancestors happy and to bring good luck. 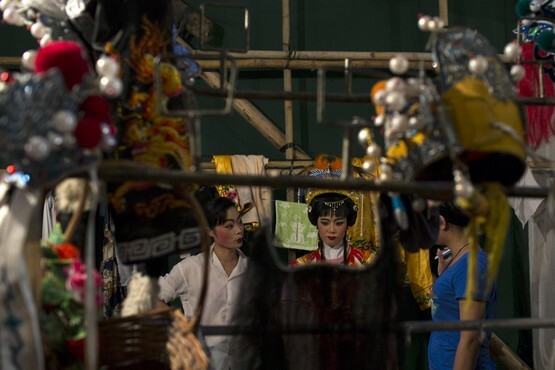 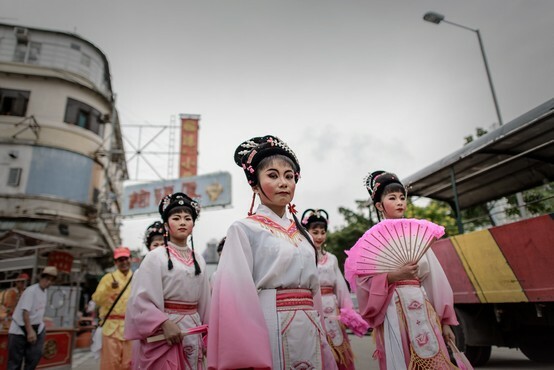 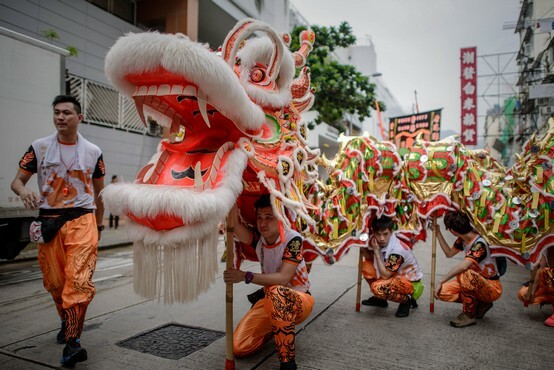 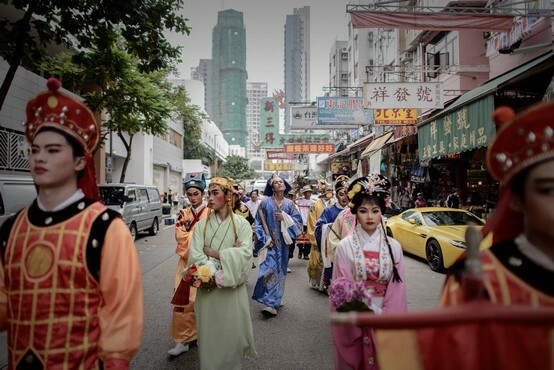 Performers prepare to take the stage at a "Getai", Mandarin for song stage, in Singapore. 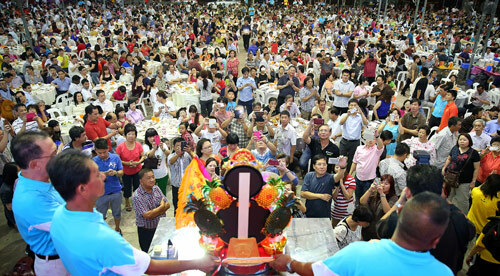 The song stages, featuring animated singers in glittering costumes belting out Hokkien, Cantonese and Mandarin hits, are held in many neighbourhoods throughout Singapore during the "Hungry Ghost month" on the seventh lunar month, when spirits are believed to freely roam the earth, to entertain the living and the dead.